As visitors descend on Tiree for the 25th annual Wave Classic competition, conservationists are warning that parts of the island’s magical landscape are coming under threat. Tiree’s machair is an ancient and beautiful habitat that can survive the worst storms nature throws at it. But on this, and other Hebridean islands, the machair is suffering permanent damage through cars and vans driving off road. More threatened than the world’s rainforests, machair is a flower-rich habitat made up of grasses and other plants growing on a thin, sandy soil. It is found only in Scotland and Ireland, and much of it is protected by European law. To help resolve the issues, an island-led community access project, led by Tiree Rural Development Ltd and funded by Scottish Natural Heritage and Argyll Estates has been initiated to improve access to key beaches through new access tracks and car parks. 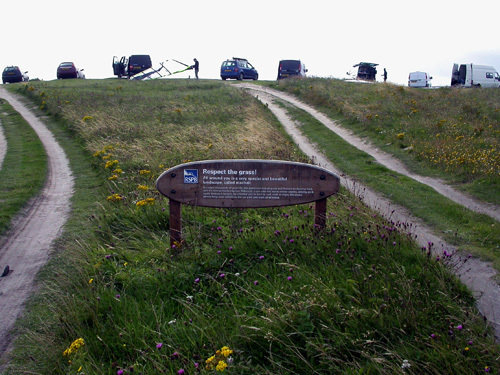 New signage is also being put up, including a striking surfboard-shaped sign at the RSPB’s Reef nature reserve. John Bowler is the RSPB Scotland officer at The Reef, one of the most popular spots on the island for windsurfing. He said: “It’s fantastic that so many people are coming to visit the island and make use of the one thing that Tiree certainly has a never-ending supply of: the wind! But a small number of people are causing serious damage to the machair by driving their vehicles over it. What happens is that the wheels break through the top layer allowing the wind and rain to get in. Once that happens, it can never recover. Erosion sets in, and before you know it, large areas are just gone. Machair is formed when shell-rich sand blows inland from beaches creating a low-lying plain that plants start to colonise. Over generations, crofters graze their animals on this grassland, improving it gently using seaweed fertilisers and allowing a unique mix of grasses and flowers to thrive. This in turn provides an ideal habitat for rare birds, like corncrakes, insects like the great yellow bumblebee, and plants like the curiously named Irish lady’s-tresses. Machair is also important for people, particularly local crofters, whose livelihoods depend upon the rich grazing areas that lie between the coast and the island’s tarmac roads.